AriticDesk gives the facility to their user to analysis the ticket at the real-time. This means the user can check the details of the work done on tickets.The real-time data reported is less than two minutes latent and auto-updates on a minute-by-minute basis. 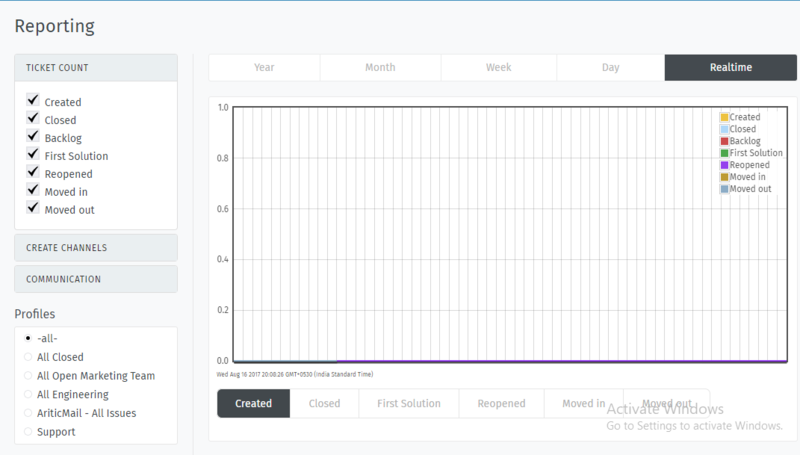 Go to AriticDesk Dashboard > Reports at the bottom of the screen. At the new page, you will get the screen like below. Click on “Realtime” tab, and choose the “ticket count”, from the left side of the screen for which you want to check the realtime activity.